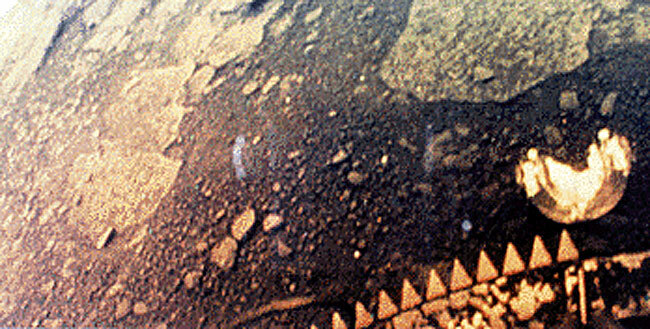 The image that you see was sent by the Russian probe Venera 13 and it is the surface of Venus, taken in 1982. It is one of the few images we have of the surface since Venus (second planet closest to the Sun), hotter than Mercury due to its atmosphere, composed mainly of sulfuric acid, carbon dioxide (hence its higher temperature, because has a great greenhouse effect) has much of what is called thermal inertia which means that when it catches temperature it is very difficult to release it obviously due to the existing carbon dioxide. An important fact that denialists of climate change indicate is a natural process and the fault is the sun. As I said, the temperature is not only because of the composition of the atmosphere but also because of its density, which makes the existing winds very strong and continuous. That is, the rotation, the density are the fault of the strong winds of the planet. The average temperature being 470 degrees (celsius). Curious about the planet is that its rotation (about itself) is the opposite of the rest of the planets (let’s not turn clockwise but anti clockwise) without knowing why. As for its composition, it is also not very clear because, as is the atmosphere, few probes have survived enough to send much data, even Venera 13 could only transmit for 2 hours before… give it for lost .